If you posses a sense of wanderlust or you’re looking for a unique honeymoon experience, you’ll want to read this post and take notes! We are back from our travels and have compiled all of our favorites from this trip in this handy guide just for you. Welcome to Bernal, Querétaro, Mexico. 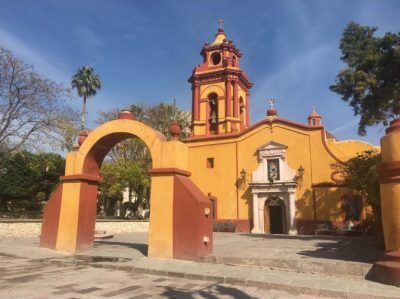 We have to give credit for our introduction to this sleepy little Mexican town to our good friend Jim Taylor with Appalachian Mountain Guides. 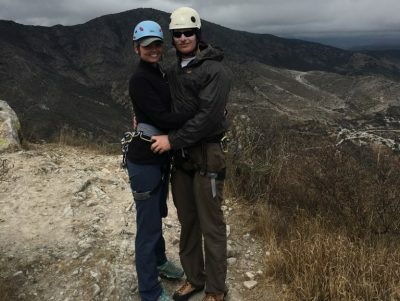 He is a world-traveler and a first-class climber, developer and guide. He knew we were looking for a unique and epic place to climb for Skip’s birthday celebration and suggested we check out Bernal. The minute we started our research, we knew we HAD to see this place! 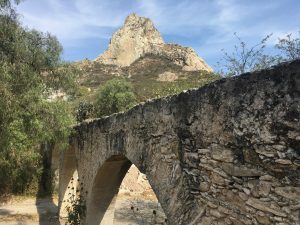 Designated as a Pueblo Mágico by the Mexican government, Bernal is purported to have healing energy and supernatural qualities that radiate from the unique rock formation commonly called La Peña. It’s located in one of the safest states in Mexico, Querétaro, and not once did we ever feel unsafe or in danger. We flew into the Querétaro Intercontinental Airport which was a short 30 minute drive just south of Bernal. Ana, the owner of Hotel Ra’ngu where we were staying, graciously met us at the airport and drove us back to the hotel. 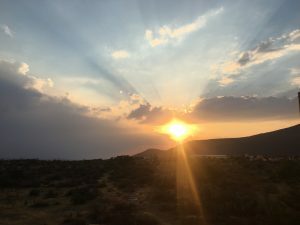 When we arrived in Bernal, it was late and dark, but the warmth of our hostess and the comfort of our immediate surroundings for the week were brilliant and a delightful surprise! 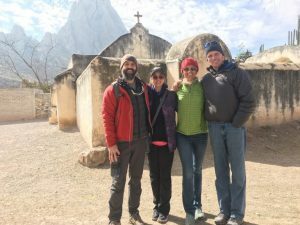 Ana and Raquel made sure we were comfortable, offered to get us something to eat and settled us in our room to welcome us home…which as we learned, Ra’ngu is the Otomi Indian word for home. with a locally crafted wool blanket with several layers of snuggly blankets and flannel sheets beneath. 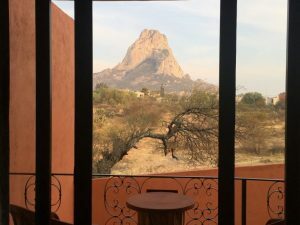 There were high ceilings with a wall of windows and a sliding door that opened out onto a private balcony with, what we would wake up to find, was an impressive view of La Peña. The bathroom featured custom tile work, a beautiful stone sink basin, and a large walk-in shower with the strongest and hottest, most glorious shower in all of Central America…(if you’ve traveled much, you know what a ginormous compliment this is). The next morning, we awoke to a stunning sunrise that painted the landscape in front of our bed spectacular desert shades. 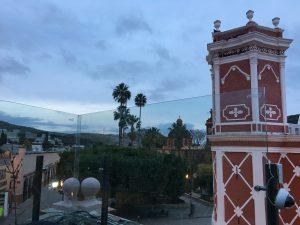 We met the rest of our group of friends and climbing partners on the third floor of the hotel in the open-air restaurant. Carmen, the chef at Ra’ngu is simply amazing and Fernanda, was truly delightful and insanely attentive. In fact, the best food and kindest staff we encountered were at this amazing hotel. 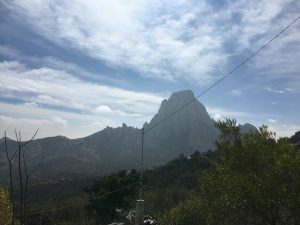 Each morning we all sat together watching the town wake up with a view of La Peña and discussed where we would climb for the day as we sipped coffee and ate a traditional Mexican breakfast. One morning, we even convinced Ana to go climbing with us! Her first ever time climbing and she did amazing! I could go on for days about all of the amazing things each of them did for us while we were there, but I think I’ll let you, Dear Reader, be pleasantly surprised. 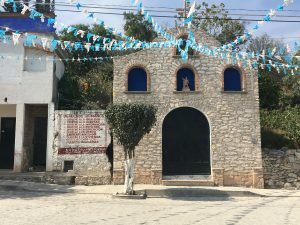 Designated as a Pueblo Mágico by the Mexican government, Bernal is purported to have healing energy and supernatural qualities that radiate from the unique rock formation commonly called La Peña. 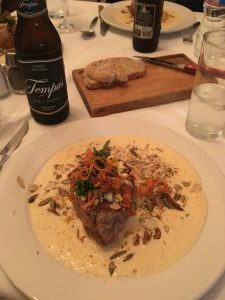 Besides dining at Hotel Ra’ngu, there are some delicious places to check out on your visit to Bernal. If you’re staying during the week, you may find many of these places are closed Tuesdays and Wednesdays. Ana made arrangements for Carmen to make us all dinner at the hotel, so if you find yourself in the same situation, just trust Ana and Carmen. You’ll be taken care of. If you’re venturing out for lunch, you absolutely must try one of the locations for Gorditas Doña Coco. My favorite was the adobo beef. Get plenty of napkins and be prepared for a party in your mouth! Skip and I both ate lunch here for roughly $5 USD TOTAL. The affordability of Bernal is shocking. The exchange rate was around $18 pesos to $1 US Dollar, so you can imagine how far your dollar will go. Also, you MUST try Arrayán Cocina Mexicana. The restaurant overlooks the fountain in the square with historic buildings and wide open windows looking onto the cobblestone street. We sat near one such window (floor to ceiling) where a wandering Mariachi band came through to serenade us. For $50 pesos ($2.77USD) we were treated to a fun and lighthearted version of Cielito Lindo. Our dinner entrees were not only delicious and perfectly cooked, each plate looked like a piece of art (pictured in this section). Skip and I enjoyed dinner here for roughly $26 USD. 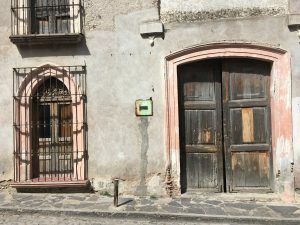 Restaurante Mesón de la Roca has amazing mole, and Restaurante Las Cazuelas has the best damn coffee in town. 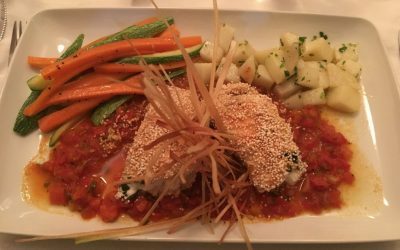 Wherever you go, your belly will be full and happy! The affordability of Bernal is shocking. The exchange rate was around $18 pesos to $1 US Dollar, so you can imagine how far your dollar will go. 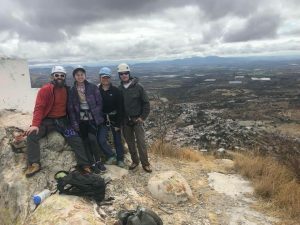 We were drawn to Bernal primarily for the rock climbing, but there truly is something for everyone there. If you’re a climber, you HAVE to top out on La Peña. Most routes are sport and we did La Bernalina. The climbs are well bolted multi-pitch, the friction is fabulous and the views are amazing. For more great climbing, check out Chichidho Ecopark. 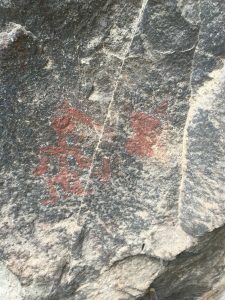 For 60 pesos, you have access to the “Muir Valley” of Bernal with well-bolted climbs, marked trails and even ancient Indian artifacts and paintings you can see. Head into the downtown area of Bernal for some shopping. Bernal is known for its candy, cheese, local wine, and wool and textiles. I snagged a handmade sweater for 100 pesos ($5.50) and there were stalls upon stalls selling beautiful handmade scarves, sweaters, coats and dresses. 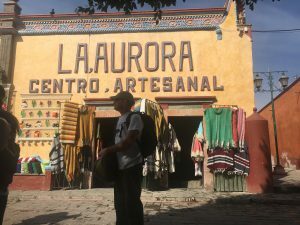 Find La Aurora Centro Artesanal and head all the way to the back of the store. Here you’ll find mountains of yarn and bags of wool where they are washing, drying and spinning the wool into yarn. 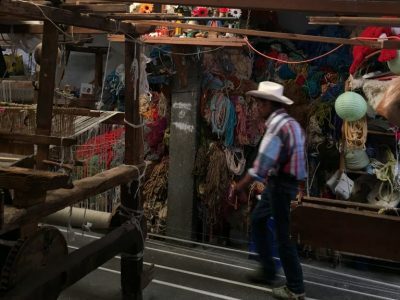 You’ll also see giant hundred year old looms with men weaving blankets, rugs, scarves and more. If you ask, they’ll happily show you around and teach you their craft. It’s totally worth an hour or so of your time. Head over to the oldest part of town and find the aqueducts. These were the water catchment and transfer systems for the town. The architecture is impressive and there are some great photo opportunities here. Go see the cathedral San Sebastian. They still hold mass in this building and if you like history and architecture, you’ll be intrigued. 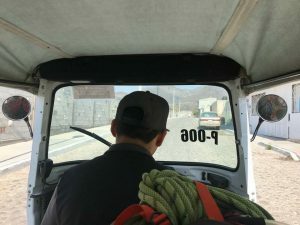 Take a moto taxi for 35 pesos to see La Peña. There’s a trail that goes up to the base and even if you don’t climb, you’ll enjoy the views. Be prepared for a strenuous hike though. Bernal also sits at around 9,000 feet in elevation, so give yourself a few days to acclimate before you try this. Ask Ana to help you schedule a visit to the tezmacal for a pre-Columbian cleansing ritual and experience some amazing culture. You can also schedule a massage ritual in your hotel room for about 40 pesos. While we didn’t get a chance to tour vineyards on this trip, Bernal sits in a region known for its wine and local goat cheeses. There are numerous tours available where you can experience the Mexican wine culture and sample the area’s best. There’s also a fair amount of mountain biking in the area from what we were told. If you’re into mountain biking, this would definitely be worth looking into. Ask Ana to help you schedule a visit to the tezmacal for a pre-Columbian cleansing ritual and experience some amazing culture. Spanish is the primary language spoken in Bernal. Besides Ana, we found very few people who spoke English. You’ll get more out of your trip if you, or someone in your group can speak Spanish. I actually think I spoke more Spanish on this trip than English and it was wonderful! Be sure to only drink bottled and/or purified water, order drinks without ice and beware of under cooked meat…the typical advice when traveling abroad. Drink plenty of water. Bernal is at elevation and in the high desert, so it’s very easy to become dehydrated, especially if you’re hiking or climbing. If you top out on La Peña, be sure to keep an eye out for Suirt, a cute and friendly little squirrel. Be mindful of your surroundings. 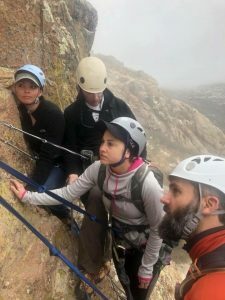 Even though we always felt completely safe in Bernal, its always a good idea to have good situational awareness and stay in groups when traveling. Most of all though, soak in some of the local flavor and culture. 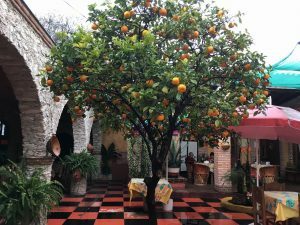 This is truly an amazing place that has not been ‘Americanized’ and retains the charm of a traditional Spanish influenced Mexican town. 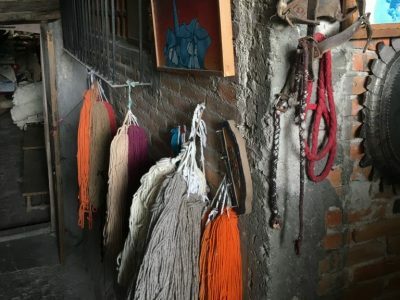 Talk with the locals, and learn a few words of Otomi, which is still widely spoken in the area. Drink in the high desert air, go to a festival (there’s typically one every weekend) and experience all Bernal has to offer. Skip and I fell in love with the town and can’t wait to return and we hope you give it a try too.